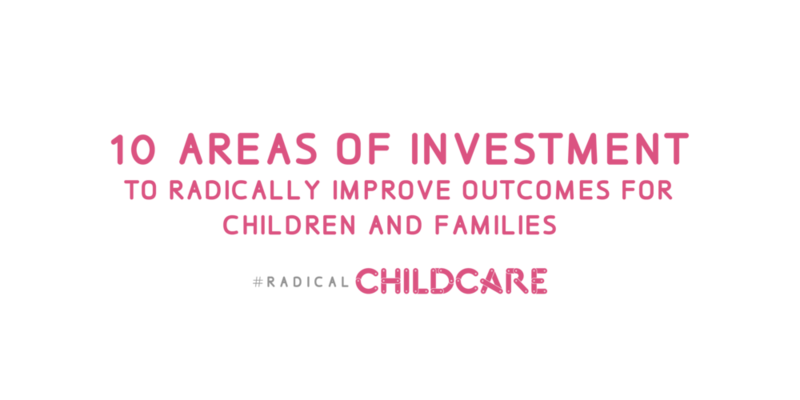 Following the #RadicalChildcare Systems Lab work over the last 3 years, we have curated 10 interdependent investment areas that we believe need to be simultaneously invested in to radically transform outcomes for children and families, co-created and generated by a range of people as part of a two day design event. Each of these investment areas contains a range of ideas to start the conversation, made up of 2 big bets we've never done before, 2 ideas that we know can work and need to be scaled, and 2 ideas that we can do right now in our neighbourhoods & on our streets. Whilst we have run #RadicalChildcare very much in the open, so far a lot of our systems research work has been internally driven and collated, but this has been an opportunity to open it all up and invite you in to make it a richer and fuller picture of the opportunities available, as well as the barriers we may collectively face in helping a new system emerge. Across a 2 day event as part of the wider systems lab and a broader movement 40 people came together to design ways to radically improve outcomes for children and families. With a range participants, speakers and combined teams from Impact Hub Birmingham and Dark Matter Labs, over 200 ideas were generated drawing on 8 family case studies, stories in the data and a range of tools designed specifically for the lab. We've made it our grand vision to radically improve outcomes for children and families, but what are the steps we can take to get there together? Here we outline some of the ingredients needed for what's next, alongside how to get involved and what to look out for. Our research combines all our work over the last three years which includes participatory action-research work with children and families at Impact Hub Birmingham to systems, desk research and ethnographic studies. Our findings have been visualised through system maps and case studies, which were developed during the systems design lab event. These outcomes and tools have been made made available as open resources along with some of the interview approaches and other methods we used in the process.